Great Smoky Mountains National Park is home to some of the most amazing hiking trails in the entire United States. 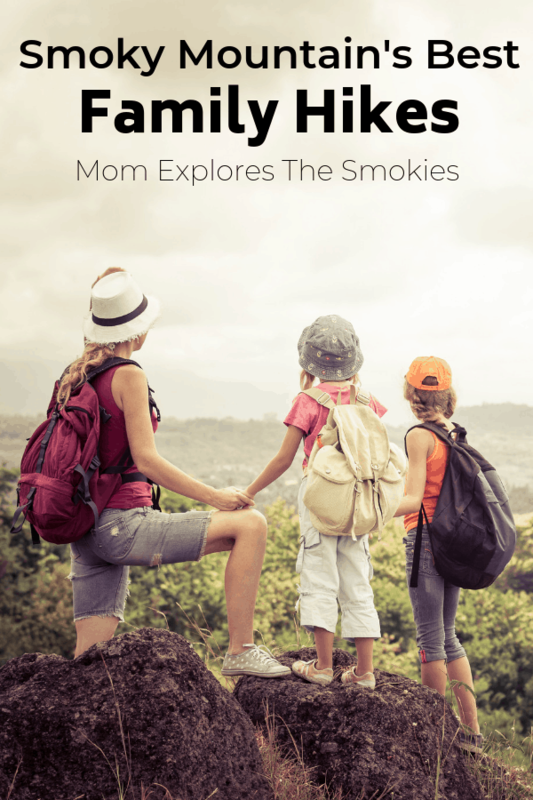 This resource features the best Smoky Mountain hikes to help you narrow your search and choose the ones that best meet your needs. Focusing on easy to moderate hikes, this list is the perfect resource for families. But don’t be fooled. Just because these trails are kid-friendly doesn’t mean they aren’t amazing! The hikes below offer a variety of perks including gorgeous views and photography spots, waterfalls, spring and summer wildflowers, and more! While Lyme disease infections are extremely uncommon in Tennessee, our ticks do have a higher likelihood of carrying Rocky Mountain Spotted Fever. This illness, while still fairly rare, can be deadly. The best way to protect against ticks is by wearing long pants and/or tall socks, and closed-toe shoes. And of course, always check yourself and your kids thoroughly after your hikes. This includes hard to reach places and throughout your hair and scalp. While hiking, please keep a safe distance from bears, elk and other wildlife. This ensures not only your safety but the animals’ safety as well. Many people don’t realized that when these wild animals become accustomed to humans, they are euthanized by the park service, in attempts to protect park visitors. Recently a mother bear and her 2 cubs had to be euthanized after they they showed repeated displays of aggression towards humans, most likely due to having been fed by humans in the past. Please do your part to protect the bears and other precious wildlife, by viewing them from afar and never leaving food or trash on the ground. For your safety, it’s also a good idea to carry bear spray. Although attacks are rare, hikers frequently encounter bears in the Smokies, even on the more well traveled trails. If you do see a bear on your hike, never you fear! The park service made this great video to explain the steps you should take to avoid catastrophe! Click on any trail name to see our full review with photos. This is a short and easy hike, although there is a bit of a drop off in some spots. The trail runs along a peaceful stream and leads to the historic Walker Sisters’ Place. This primitive homestead is where the Walker Sisters continued to live after refusing to sell their land to the Great Smoky Mountains National Park. There are picnic areas at nearby Metcalf Bottoms. This very short trail starts at Metcalf Bottoms picnic area and ends at the historic Greenbriar Schoolhouse. From the schoolhouse, you can either turn back or continue on to the Little Briar Gap trail (above). This hike begins on a wide gravel trail, but the pathway changes over to dirt a short way into the hike. This trail is completely paved and with only a moderate incline. Also, there are no steep drop offs on either side of the trail. The coolest part is that it leads to a man-made tower that offers stunning 360° views. On one side you can see the expansive Smoky Mountains, while the sweeping Tennessee Valley is on the other. Please do watch your children very closely while on top of the tower. The fall would be deadly. This trail is located along the scenic Foothills Parkway, which offers stunning mountain views and plenty of pull-offs for photographs. It is important to note that there are no amenities on this trail nor on the parkway. This kid-friendly trail is great for viewing wildflowers in both spring and summer. The path is very wide and follows a small stream. There is a designated parking lot for this trail. If you are not in a parking lot, you are in the wrong place. We found this out the hard way! One of the easiest Smoky Mountain Hikes, this trail is also one of the few that allows dogs. Of course, furry friends must be kept on leash. This trail runs along the little pigeon river and is relatively level, although not paved. There are also some historical sites along the trail. The trail is close to the Sugarlands Visitor Center which offers educational indoor entertainment, a gift shop, and restrooms. This is by far the easiest of all the trails and the best for taking very young kids hiking, where they can actually walk. Our toddler walked the entire way. The trail is paved and is 100%, without question, stroller and handicap accessible. This hike is also located near the Sugarlands Visitor Center, which offers educational indoor entertainment options, a gift shop, and restrooms. Despite the short length of the trail, it is very scenic. It runs along a small peaceful steam and it completely wooded the entire way. This short but scenic loop trail, features a variety of spring wildflowers and is convenient to the infamous and popular Elkmont Ghost Town. Although short, this fun trail features a gorgeous waterfall and scenic footbridge. You can extend your visit, by packing a picnic lunch and getting your feet wet in the creek. You can also explore one of the other great trails in the area, like the Deep Creek Loop trail, on our moderate list below! Just a stone’s throw way from Juney Whank Falls (above), this pleasant trail is short enough that you could hike both trails back-to-back. There are benches near the falls for a relaxed viewing experience. This is one of only 2 trails to allows dogs in Great Smoky Mountains National Park, and one of only 3 to allow bicycling. Many families report that jogging strollers do well on this peaceful scenic trail. In the spring the trail features a nice variety of wildflowers. You can also visit the adjacent (and FREE) Mountain Farm Museum, any time of year. Follow this family-friendly hiking trail to a large clearing called Andrews Bald. This location offers spectacular mountain views year round and is a popular photography spot. This is also an especially excellent hike for viewing wildflowers in late spring and early summer. The trail is accessible from the Clingman’s Dome parking lot, which has restrooms, a picnic areas and a small gift shop. This summit trail leads you to a tower atop the highest peak in the Smoky Mountains. The tower offers spectacular 360 degree mountain views and wonderful photography opportunities. Although the trail is paved, it is extremely steep. Personally I am adamant that this trail, despite being paved, is NOT stroller accessible and the park service agrees. This is a looped hiking trail, which means there is no need for backtracking. This short and sweet hike provides excellent views of wildflowers in March and April and is a great spot for kids’ hiking. There are restrooms at the nearby Chimney Tops picnic area. 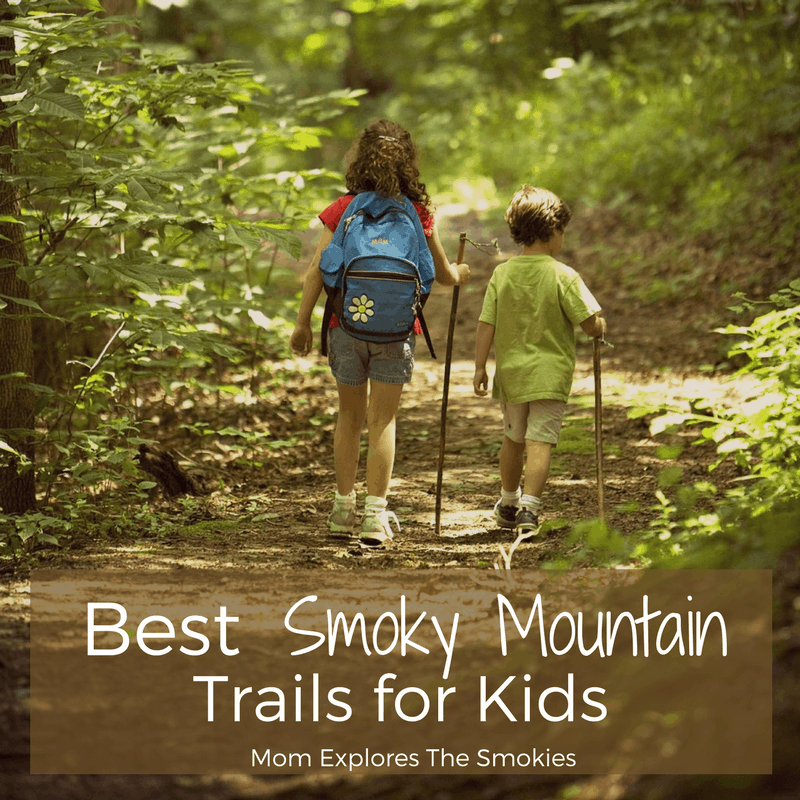 This family-friendly Smoky Mountain trail runs along a creek and is noted for bear activity. So, be sure to bring your bear spray. At times, there is a moderate incline along the trail with a steep drop off to one side. There is also a fun historical cabin located on the trail, which makes a great opportunity for family photos. From this trail, you can continue on to Cataract Falls. Although mostly uphill, the incline of this easy kid-friendly hiking trail is gradual and manageable. This a great spot to look for the famed red-cheeked salamander, which is native to the Smokies. One of the best features of this trail is, once you reach the waterfall, you can actually walk behind it. We did and it was a blast! This unique feature makes this one of the most popular Smoky Mountain trails in the entire park. This trail follows a picturesque stream and features historical landmarks including the remnants of an old barracks, a old log cabin, and the remnants of an old fish hatchery. Laurel Falls is the MOST popular hiking trail in all of Great Smoky Mountains National Park and boasts an 80 foot tall waterfall. Due to the popularity of this trail, it tends to be very busy, but there is plenty of parking available along the road. Once you reach the waterfall, there are small natural pools for wading, which makes this a great summer choice. Although paved, this trail is NOT stroller accessible. This trail is wide and spacious and follows the path of the Little River. It’s an excellent spot for wildflower viewing in March and April. There are historic landmarks along this trail, and picnic areas are located at nearby Elkmont. Follow the creek as you enjoy spectacular views of the forest. In March and April, the first 1.5 miles of this hike offer stunning views of wildflowers. There are also a few historical buildings located along trail. Picnic areas are available at nearby Greenbrier. While still classified as moderate, Rainbow Falls is the most difficult hike on our list and does at times have a strenuous incline. While not the best trail for families with small children, this beautiful trail boasts an impress 80 foot waterfall and is a good choice for older kids. The falls get their name from the radiant canvas of colors that are cast onto the surrounding rocks. I will caution you not to climb the rocks at the foot of waterfall. There are signs advising against it, because the rocks do get very slippery. I have seen kids fall and get hurt, but of course the decision is ultimately up to you. Happy hiking in the Smoky Mountains, y’all! It’s a great vacation spot too!